Organized by seven members of the Military Council of the Irish Republican Brotherhood, the Rising began on Easter Monday, 24 April 1916, and lasted for six days. Members of the Irish Volunteers — led by schoolmaster and Irish language activist Patrick Pearse, joined by the smaller Irish Citizen Army of James Connolly, along with 200 members of Cumann na mBan — seized key locations in Dublin and proclaimed an Irish Republic. There were isolated actions in other parts of Ireland, with an attack on the Royal Irish Constabulary barracks at Ashbourne, County Meath and abortive attacks on other barracks in County Galway and at Enniscorthy, County Wexford. The Irish Republican Brotherhood (Irish: Bráithreachas Phoblacht na hÉireann) was a secret oath-bound fraternal organization dedicated to the establishment of an "independent democratic republic" in Ireland between 1858 and 1924. Its counterpart in the United States of America was organized by John O'Mahony and became known as the Fenian Brotherhood (later Clan na Gael). The members of both wings of the movement are often referred to as "Fenians". The IRB played an important role in the history of Ireland, as the chief advocate of republicanism during the campaign for Ireland's independence from the United Kingdom, successor to movements such as the United Irishmen of the 1790s and the Young Irelanders of the 1840s. They were dissolved in 1924. The Irish Citizen Army (Irish: Arm Cathartha na hÉireann) rose out of the great strike of the Irish Transport and General Workers Union in 1913, known as the Lockout of 1913. This strike caused most of Dublin to come to an economic standstill and was marked by vicious rioting between the strikers and the Dublin Metropolitan Police, particularly at a rally on O'Connell Street on 31 August, in which two men were beaten to death and about 500 more injured. The Irish Citizen Army underwent a complete reorganization in 1914. The ICA's last public appearance was to accompany the funeral procession of union leader James Larkin in Dublin in 1947. Cumann na mBan (Irish pronunciation: [ˈkʊmˠən̪ˠ n̪ˠə mˠan̪ˠ]; The Irishwomen's Council), abbreviated CnamB, is an Irish republican women's paramilitary organization formed in Dublin on 2 April 1914, merging with and dissolving Inghinidhe na hÉireann, and in 1916 it became an auxiliary of the Irish Volunteers. The constitution of Cumann na mBan contained explicit references to the use of force by arms if necessary. At the time the Government of Ireland Bill 1914 was being debated, and might have had to be enforced in Ulster. 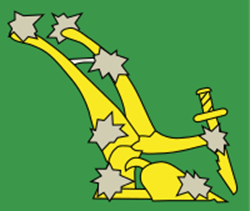 The primary aims of the organization as stated in its constitution were to "advance the cause of Irish liberty and to organize Irishwomen in the furtherance of this object", to "assist in arming and equipping a body of Irish men for the defense of Ireland" and to "form a fund for these purposes, to be called 'The Defense of Ireland Fund'". With vastly superior numbers and artillery, the British army quickly suppressed the Rising, and the insurgents agreed to an unconditional surrender on Saturday 29 April. The British Army reported casualties of 116 dead, 368 wounded and nine missing. Sixteen policemen died, and 29 were wounded. Rebel and civilian casualties were 318 dead and 2,217 wounded. The Volunteers and ICA recorded 64 killed in action, but otherwise Irish casualties were not divided into rebels and civilians. All 16 police fatalities and 22 of the British soldiers killed were Irishmen. British families came to Dublin Castle in May 1916 to reclaim the bodies and funerals were arranged. The majority of the casualties, both killed and wounded, were civilians. Both sides - British and rebel - shot civilians deliberately on occasion when they refused to obey orders such as to stop at checkpoints. A total of 3,430 men and 79 women were arrested, although most were subsequently released. In a series of courts martial beginning on 2 May, 90 people were sentenced to death. Fifteen of those were executed by firing squad between 3 and 12 May. 1,480 men were interned in England and Wales. A Royal Commission was set up to enquire into the causes of the Rising. It began hearings on 18 May. The report, published on 26 June, was critical of the Dublin administration, saying that "Ireland for several years had been administered on the principle that it was safer and more expedient to leave the law in abeyance if collision with any faction of the Irish people could thereby be avoided." The Garden of Remembrance opened in 1966, to mark the anniversary of the Rising. 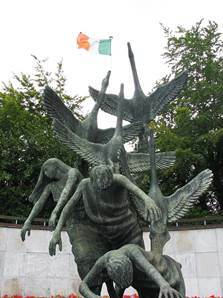 The Garden is "dedicated to all those who gave their lives in the fight for Ireland's freedom". The site of the Garden is where the Irish Volunteers were founded in 1913, and where several leaders of the 1916 Rising were held overnight before being taken to Kilmainham Gaol.